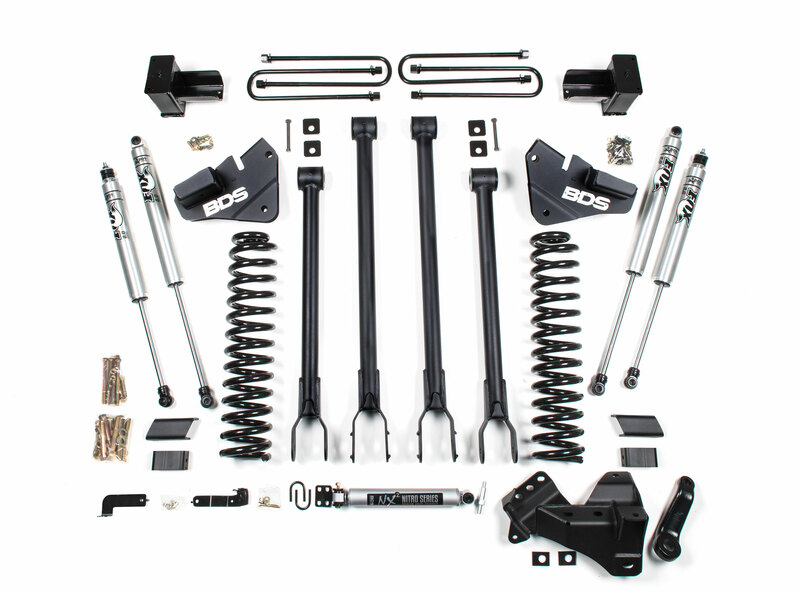 BDS Suspension is now shipping a diverse lineup of suspension systems and accessories for the 2019 Ford F250/F350 Super Duty 4wd trucks. Available in 1", 2", 4", 6" and 8" lift heights along with FOX shocks/coilovers, Recoil traction bars and more, BDS Suspension offers lift options to meet your needs and fit up to 40" tires. 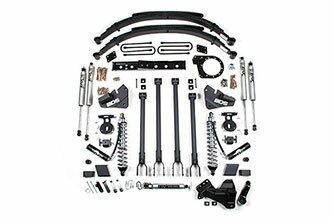 These kits carry over from 2017-2018 model kits and have been confirmed compatible with the 2019 Ford Super Duty trucks. As with all BDS kits these include Factory Protection Plus (FPP) for peace of mind wherever you adventure. Included in FPP is BDS's No Fine Print Warranty and a 5-year, 60,000-mile supplemental drivetrain warranty. Improve the performance, capability, and curb appeal of your new 2019 Ford Super Duty with BDS Suspension. 1" Leveling Kits: Starting out the 1" leveling kit designed to raise the front end for a more level stance, its also popular if adding a plow or other heavy accessories to retain ride height. The spacers are build from 6061-aluminum and bolt into place at the axle mount. The design improves stance as well as better wheelwell appearance compared to a top mounted spacer. Also included are your choice of NX2 gas shocks or FOX 2.0 performance shocks for improved performance at each corner of the truck. This kit offer clearance for up to 34" tires. 2" Leveling Kits: Building on the 1" kits, the 2" leveling kits utilize a pair of 6061-aluminum 2" lower coil spacers to bolt in for a lifted/leveled stance with room for 35" tires. 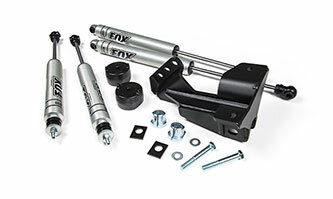 Also supplied with this kit are a pair of ball joint alignment cams to correct the axle positioning. To correct the front axle lateral positioning a heavy duty replacement track bar drop bracket bolts in place of the factory track bar frame mount. This bracket is built from 1/4" steel, full welded and finished in a durable textured black powdercoat. To improve help improve the overall ride quality and dampening performance this kit includes your choice the BDS NX2 series gas shocks or specially tuned FOX 2.0 performance shocks for the front and rear of the new Super Duty. 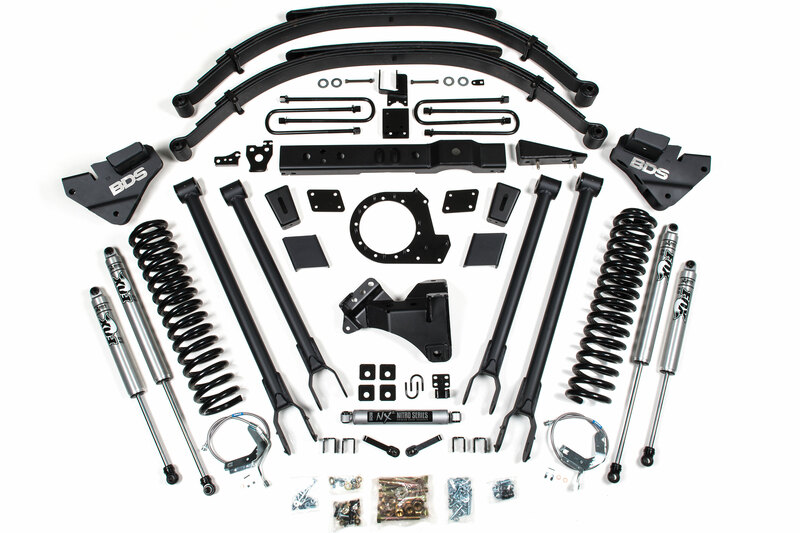 4" Radius Arm, 4-Link and Coilover Kits: A popular option for the late model Super Duty, these 4" lift systems allow fitment for 37" tires while improving the appearance and capability. The 4" kits are offered in several configurations to include both front heavy duty radius arms as well as a 4-link conversion for improved strength, handling and caster control. Standard kits use 4" ProRide coil springs and your choice of NX2-series or FOX 2.0-series gas shocks while the performance option is to convert over to FOX 2.5 factory series coilovers with remote reservoir paired with FOX 2.0 shocks at each corner. Steering angles are corrected with a forged drop pitman arm with an integrated drag link flip. This is used in combination with the 1/4" thick heavy duty track bar drop bracket will position the front axle and keep the track bar angle in phase with the steering for improved handling. 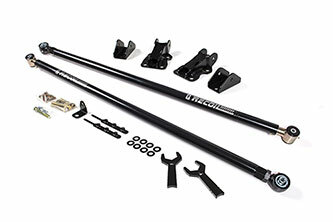 Also included are a pair of sway bar relocation brackets, bump stop extensions, brake line relocation brackets, an OE replacement single NX2 steering stabilizer, replacement rear lift blocks and longer u-bolts to complete the install. 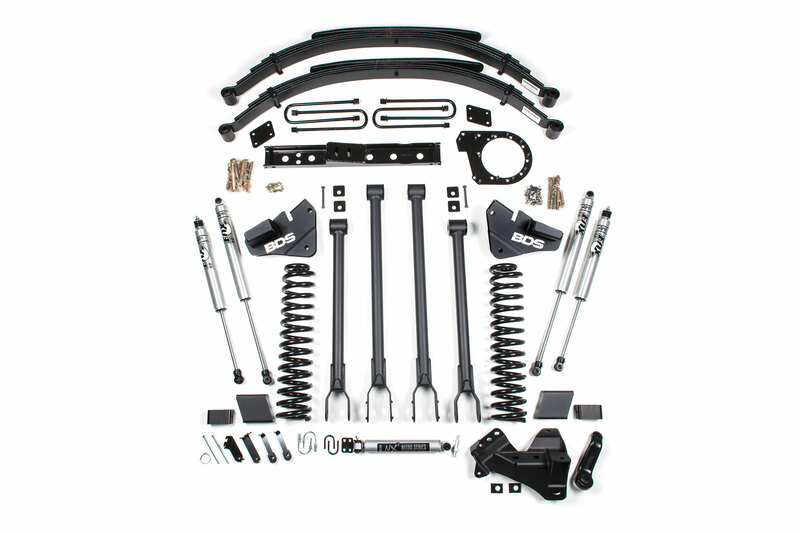 6" 4-Link and Coilover Kits: Stepping up to the 6" systems, BDS converts the radius arm over to a 4-link for improved strength, handling and caster control. The 4-link brackets are built from high strength 1/4" steel and tie into the factory radius arm mounts and transmission crossmember for a rigid mount. 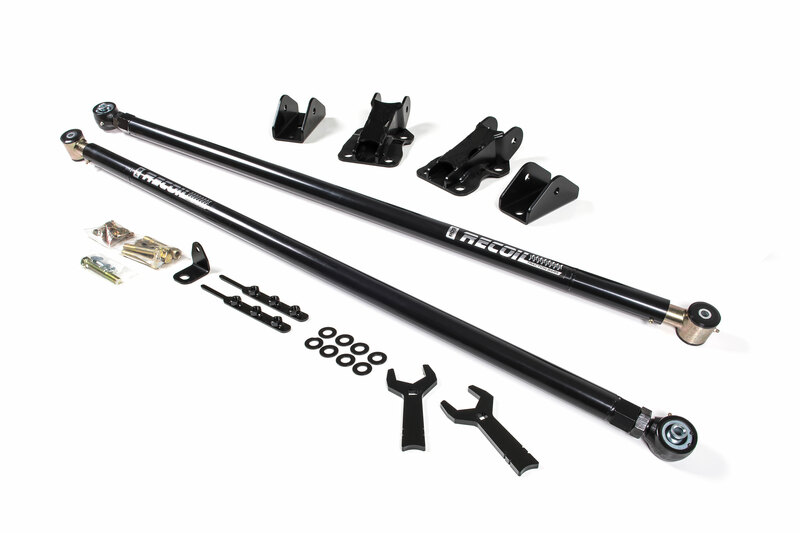 The UCA/LCA are built from heavy wall 2" OD DOM steel tubing with massive 2-1/2" greaseable frame mount bushings and reinforced clevis mounts to attach at the axle. The standard kits use 6" ProRide coil springs to pair with your choice of NX2-series or FOX 2.0-series gas shocks while the performance option are FOX 2.5 factory series coilovers with remote reservoir paired with FOX 2.0 shocks up front. For steering correction a forged drop pitman arm and heavy duty track bar relocation bracket are supplied. 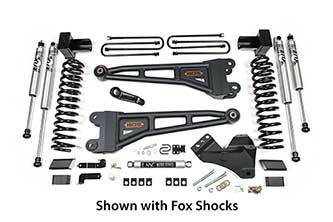 Also supplied are bump stop extensions, sway bar drop brackets, and brake line relocation brackets. The 2017-2019 models use a new front driveline design that requires correction at 6" of lift and above to allow for use of 4WD at any speed. To do this BDS supplies a high strength transfer case indexing ring to rotate the front output of the transfer case down to improve the front driveline operating angle. The indexing ring uses ARP studs and includes new mounting hardware. Also supplied is a heavy duty replacement transmission crossmember to allow additional clearance. In the rear of these 6" systems BDS offers multiple lift options for both the OE 2-leaf main spring pack and OE 3-leaf main spring pack equipped trucks including both replacement rear lift block kits as well as full replacement GlideRide leaf springs. Rounding out these kits is a rear brake line bracket and your choice of rear shocks for improved ride quality and clearance for up to 38" tires. 8" 4-Link Kits: These 8" 4-link systems are build to stand up to whatever abuse you can throw at it. 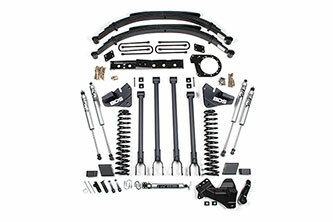 Up front these kits use a heavy duty front 4-link control arm conversion for improved strength, handling, and caster control. The 4-link brackets are built from 1/4" steel and tie into the factory radius arm frame mounts and transmission crossmember for an extremely rigid control arm mount. Upper and lower control arms are built from heavy wall 2" OD DOM steel tubing with massive 2-1/2" greaseable frame mount bushings and reinforced clevis mounts to attach at the axle. 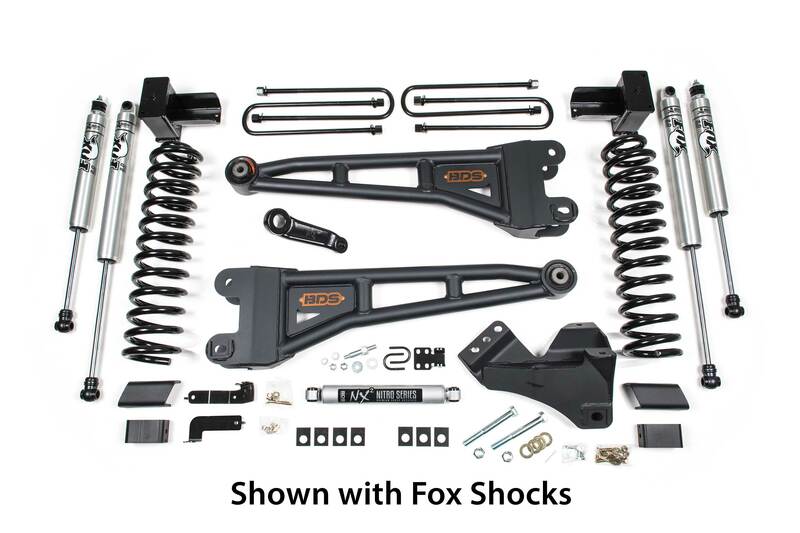 The extra ride height comes from a pair of 8" ProRide coil springs designed specifically for the weight of the diesel-equipped trucks for a smooth ride paired with your choice of specially tuned BDS NX2 series gas shocks or the premium FOX 2.0 IFP performance gas shocks at each corner. 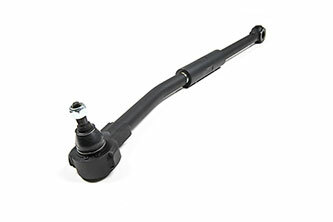 For steering correction a forged drop pitman arm and heavy duty track bar relocation bracket are supplied. This brings the drag link angle closer to factory and keeps the steering angles in line with the relocated track bar for improved drivability and a recentered front axle. Also supplied for the front are bump stop extensions to limit suspension compression, sway bar relocation brackets with extended sway bar links, and braided stainless steel brake lines. The new front driveline design requires correction when installing the 8" lift to retain use of 4WD at any speed. To do this BDS supplies a high strength transfer case indexing ring specific to the 8" systems to rotate the front output of the transfer case down to improve the front driveline operating angle. The indexing ring uses ARP studs and includes new mounting hardware. 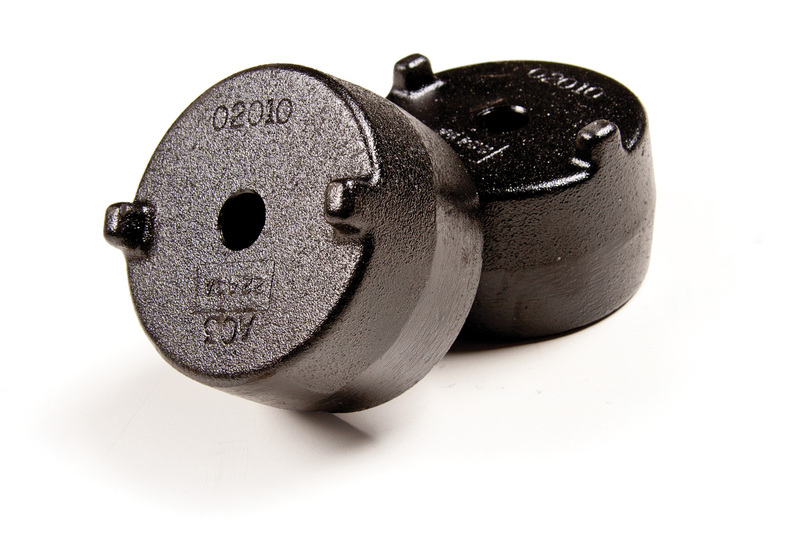 BDS also supplies a heavy duty replacement transmission crossmember and new transfer case mounting bracket. In the rear of these 8" systems BDS supplies full replacement Glideride leaf springs to provide full lift height and increased capacity with a built in overload spring. These 8" 4-link systems allow for clearance of 38-40" tires. 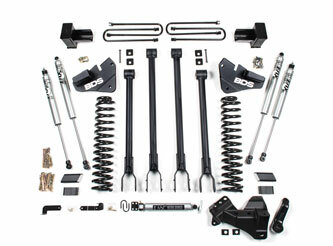 Available Accessories: BDS offers a number of kit accessories for the 2017-2018 Ford Super Duty designed to further enhance the truck's performance. While the standard steering stabilizer is sufficient at controlling from end shimmy caused by oversized tires, BDS also offers a dual steering stabilizer kit that offers better control, steering firmness. Available with your choice of NX2 cylinders or FOX 2.0 50/50 valved gas cylinders these dual steering stabilizer kits help keep you in control with aggressive, oversized tires over rough terrain. Recoil traction bars improve performance on the street without binding up the rear suspension like most traction bar kits on the market. This revolutionary full float design uses an internal 3000 lb/in compression spring that can be preloaded while installed on the vehicle to offer a range of settings. 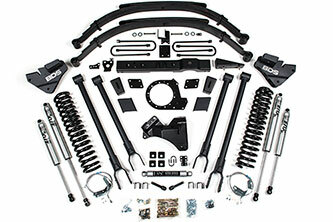 These kits use vehicle specific mounting brackets designed specifically for the late model F250/F350 with 3.5-4" diameter rear axles. Take your new 2019 Ford Super Duty to the next level with BDS Suspension.